Pillow top mattress pads provide a protective layer for your mattress while also providing a soft plush layer of comfort that helps make any ho-hum mattress feel like new again. These toppers or pads can be one-fourth inch thick or as much as two and a half inches thick, which gives you the freedom to choose the style and comfort levels you prefer. Mattresses come in many sizes, comfort levels, materials, and price ranges and mattress toppers are no different in that regard. There are several types from which to choose! Pillow top mattress pads are most often referred to as mattress toppers. They're essentially a top layer that can be added to your mattress as long as it's in decent condition without any significant sagging in any part of the mattress. Toppers are an inexpensive way to add a plush feeling of support and comfort to any style of mattress. These wool toppers aren't anything like the scratchy, itchy wool blankets you may remember as a child! Wool mattress pads are made from wool blends from a variety of sources including alpaca wool and lamb's wool. You can also find wool toppers that combine the great qualities of wool with synthetic materials. These types of toppers provide more support than 100% wool toppers. All of them are amazingly soft and feel very cozy and inviting. Egg crate toppers are the go-to mattress pads for anyone who has experienced back pain or other chronic medical issues. This uniquely shaped pad can be used with the bumps face down into the mattress or facing up so you'll be lying on them directly. People who have difficulty sleeping due to painful pressure points will appreciate the comfort and support of an egg crate topper. The feather or down mattress topper is designed to add cushioning or a more plush feeling to your mattress. They're made from a combination of goose or duck down and can sometimes contain feathers in addition to the down. Latex toppers contour to and cradle the shape of your body, providing support while making you feel like you're sleeping in luxury. Latex comes in all natural or synthetic forms, but all are made from rubber tree sap as the main ingredient. These are typically the most popular choice when it comes to pillow top mattress pads. They're excellent for support and relieving painful pressure points. 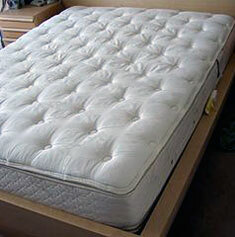 Many people opt for a memory foam topper rather than spending the money on a memory foam mattress. Did you know that memory foam has been linked to adverse physical reactions? Some people who have slept on memory foam develop health problems and have more difficult sleeping. Please visit our page that discusses the potential dangers of memory foam before choosing a mattress or mattress pad that contains memory foam. The first thing you need to do before shopping for a topper is to decide whether it will make a significant difference for you on your existing mattress. If your mattress is sagging a lot or has developed trenches or deep indentations, a topper won't help. But if your mattress is in good condition, a topper will work well. Try out as many as you can in an actual store! Make note of the density and thickness of the toppers you like the best. Allergy sufferers need to be careful about the materials used in the topper they choose. Be sure to find out what materials have been used to make the topper you are interested in buying before actually making the purchase. There are some toppers out there that are marketed as healthy and safe, when in fact they have been manufactured using a good amount of "good" fabrics, but also a percentage of chemically derived fabrics. Those are the ones that could cause an adverse physical reaction and should be avoided. Read customer reviews of the different styles of toppers. Keep in mind that you can save money on a mattress and then purchase one of many pillow top mattress pads to enhance the comfort and/or support of your new mattress! Plus, you might decide later to switch out the topper and that's easily and inexpensive to do. Which Pillow Top Mattress Cover is Best?